Ekiti State Governor, Mr. Ayodele Fayose has called for three days of fasting and prayer for the All Progressives Congress (APC) former governorship aspirant, Hon. Michael Opeyemi Bamidele and others that were hit by bullets fired by a trigger happy policeman at the APC secretariat on Friday. The governor, who also directed the suspension of all open campaign activities of the Peoples Democratic Party (PDP) in the State for three days, demanded that those found culpable in the invasion of the State with illegal policemen that were involved in the shootings must be brought to book. 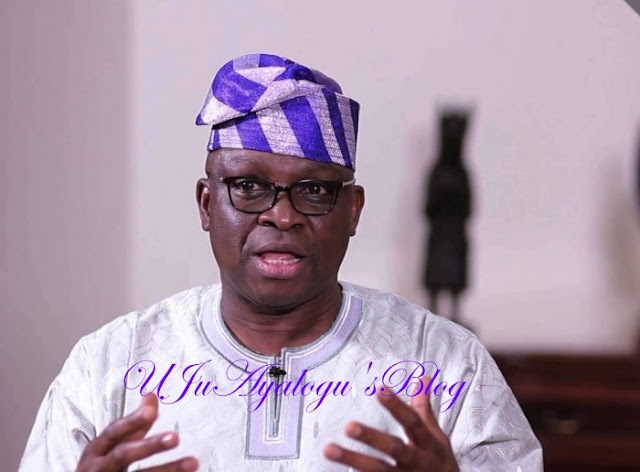 In a statement issued on Sunday and signed by his Special Assistant on Public Communications and New Media, Lere Olayinka, Governor Fayose said even though he was glad that Hon. Opeyemi Bamidele was responding to treatment, it was necessary that Ekiti people should support him and others with prayers. “Our doctors can only try; it is only God that heals. Therefore, it is important at this point for all of us in Ekiti to go to God in prayers so that He can heal our brother and friend, Opeyemi Bamidele and others who sustained injuries on Friday. “At this point, it is immaterial the political party that he belongs to, what is important is the life of an Ekiti son and I pray that God will touch Opeyemi Bamidele with His healing hands. “Most importantly, Opeyemi Bamidele is a man that I have great respect for and since he has now been airlifted out of Ekiti for further treatment elsewhere, all we can do is to pray for him,” the governor said. While urging politicians in the State to shun violence, the governor said the people should learn from the sad incidence and shun politics of violence. “We must all shun violence and stop this mindset of coming to oppress the people of Ekiti with federal might. Those planning violence must be mindful of the fact that one can only know the beginning of violence, not the end,” he said.